Over 3.5 billion passengers fly each year – that’s more than an average 9 million passengers every day around the world – and air traffic is expected to increase in coming years. To meet the needs of this influx of travelers and ensure safe, reliable operations, it’s essential that airports have a dependable energy supply and modernized low and medium voltage systems. Recent events give a glimpse into the costly consequences of airport blackout. In December 2017, for example, Atlanta’s Hartsfield-Jackson International Airport experienced an 11-hour power outage. It resulted in 1,400 flight cancellations and cost Delta Airlines an estimated $50 million. The goal of upgrading and modernizing airports’ electrical distribution systems isn’t just about cost savings, though. Providing reliable power is a critical safety issue that airports must make a priority. It’s essential for all operations: From powering the control tower that directs air traffic to lighting the way for passengers to safely navigate through the terminal. Making infrastructure improvements also increases airports’ efficiency, quality of services, and provides a positive experience for travelers. Sophisticated technology is the key to a successful modernization. Indeed, switchboards can now be equipped with sensors and online monitoring tools that allow a transition to condition-based maintenance, helping to reduce downtime and optimize maintenance costs. Thermal and environment monitoring: Thanks to 24/7 condition monitoring of hotspots, users can detect issues early and take preventive action. Alarms and warnings are delivered locally or remotely, as preferred. Circuit breaker monitoring: Real-time monitoring of circuit breaker performance provides up-to-the-minute insight into its health, supported by alarms and warnings in case of events. Performance data can be used to create better long-term maintenance plans. Concretely, this efficient and connected asset management is a core part of preventing potential outages, giving operators real-time equipment status updates, and helps them react quickly and effectively. The real-time information generated by embedded intelligent devices supports both better decision making throughout operations, and the automation of many functions. Mass amounts of collected data are also used for future planning, by analyzing patterns and root causes of the problems, which allows for prevention and correction. Modernization initiatives also help airports meet their energy efficiency goals and reduce their carbon footprint. Using the data amassed from advanced technology allows operations to centralize energy information and generate more accurate reports about energy use and operational efficiency. These changes don’t come without tough challenges, though. Airports are a 24/7, 365 days a year, highly sensitive work environment with complex operations and systems. Downtime can be critical, impacting not just passengers but also cargo and emergency operations, so any modernization efforts must be conducted with minimal effect on operations and customers. This requires a cohesive strategy that takes into account the many areas of business that modernization can affect to minimize any negative effects. Upgrading infrastructure is a must for airports to prevent electrical distribution issues and prepare for the growth in air traffic. 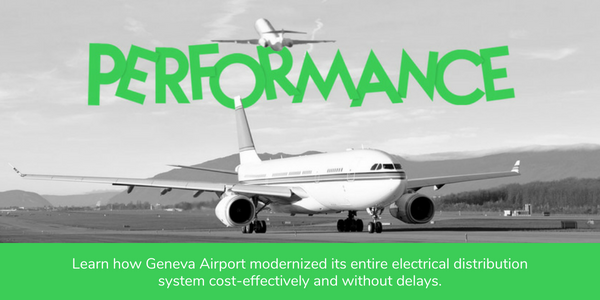 Learn how Geneva Airport modernized its entire electrical distribution system cost-effectively and without delays.